Roasting the carrots in this recipe really intensifies their flavor and sweetness and though many vegetable keftedes are made with eggs or cheese, they’re not missed in this traditional vegan (or Lenten) version. 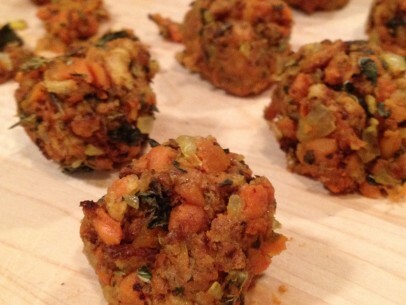 And carrot keftedes are a great way to use up stored winter carrots as well as older, less pretty carrots too. Try using pieces of whole wheat, rye or barley bread, well toasted and crushed up, for breadcrumbs instead of store bought. They’re fresher and you can choose your type/flavor of bread! Important to remember – after you’ve tossed your chopped carrots with spices, olive oil and minced garlic, turn out carrots onto a lined baking sheet for easier cleanup and then SET THE BOWL ASIDE FOR LATER . You’ll add your roasted carrots back into the same bowl when its time to mash them so you can pick up any left behind spiced oil and get every bit of flavor into the carrot mash. carrots mixed with oil and spices – save the bowl! 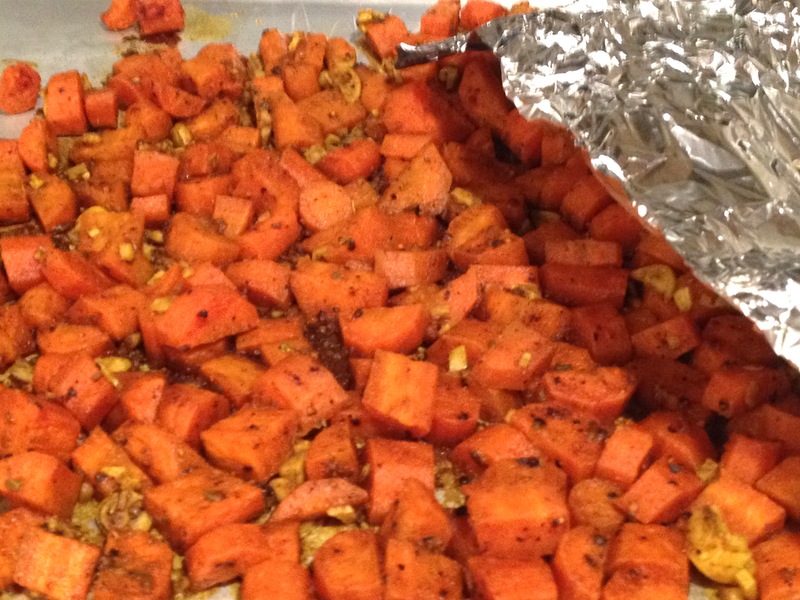 And its helpful to tent, or partially/loosely cover, the carrots with aluminum foil while they’re roasting. This keeps them from browning and speeds up cooking time a bit. Once they’re roasted, add the carrots back into the bowl they came from and mash with potato masher or back of wooden spoon. A coarse mash is fine because you’ll pop the mixture into the blender or food processor for just a minute to bring everything together. 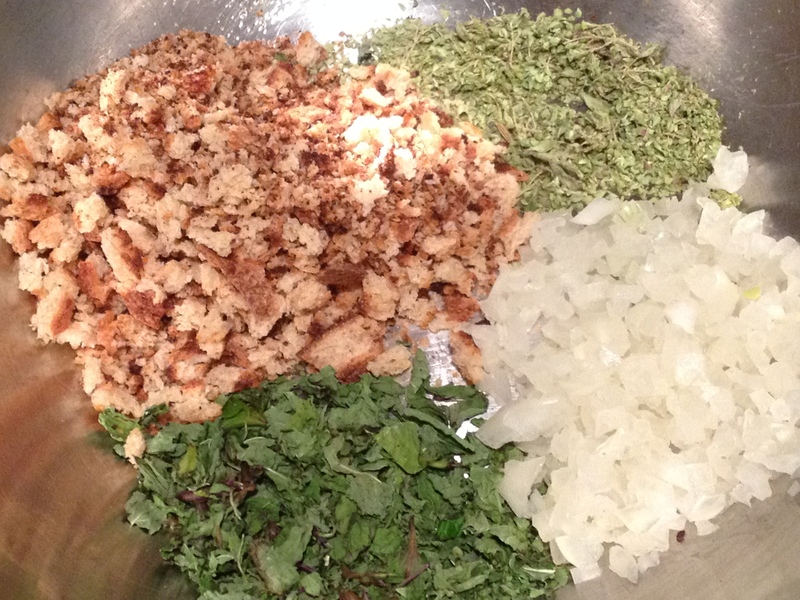 Get your herbs, breadcrumbs and minced onion mixed up in a large bowl before mixing in carrot mash. This incorporates all the ingredients more evenly throughout the mixture. Make sure to combine everything completely before whizzing it all together in the blender or food processor. You can blend or process in batches if you’d like for easier managing. If you have time, once you’ve returned the now completely combined keftedes batter back into the bowl, cover loosely with plastic wrap and refrigerate for an hour or so to let the flavors really meld together. Its fine to skip this step if you need to or alternately, you can make the batter up to 5 days ahead of when you want to fry up your keftedes. Peel and slice carrots into small rounds, toss with olive oil, salt, pepper, fennel seed, turmeric, allspice and minced garlic in medium bowl. Turn out onto baking sheet. Set the bowl aside – do not rinse! Roast carrots for 30-35 minutes at 425 degrees until fork tender. 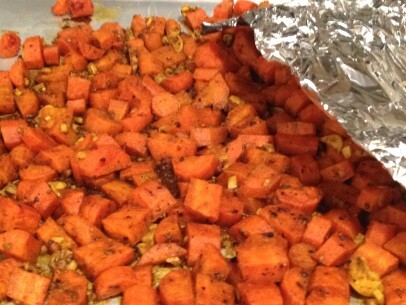 Lightly lay a piece of aluminum foil over the top of carrots while roasting so they don’t get too brown. 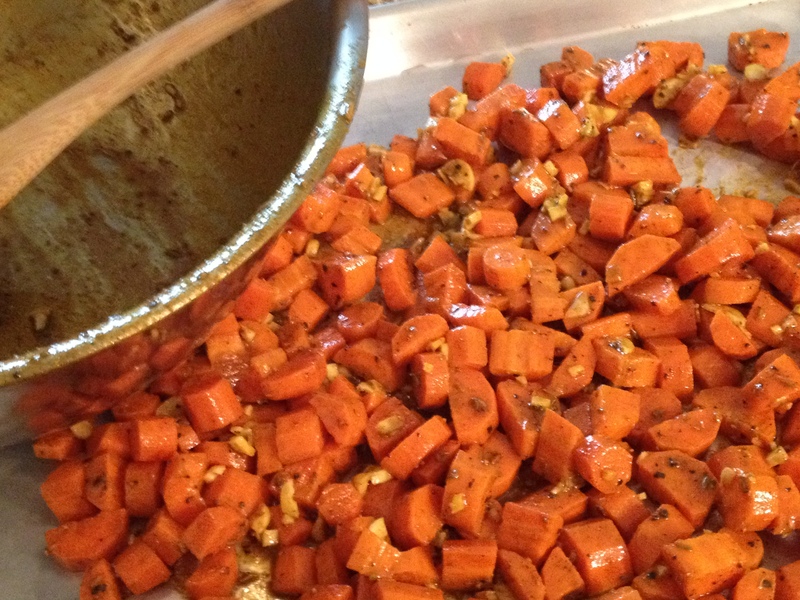 Return roasted carrots to the bowl you mixed them in. Cool slightly and mash coarsely in bowl with potato masher, fork or back of wooden spoon. Set aside. In new larger bowl, combine chopped fresh mint, oregano, minced onions and breadcrumbs. 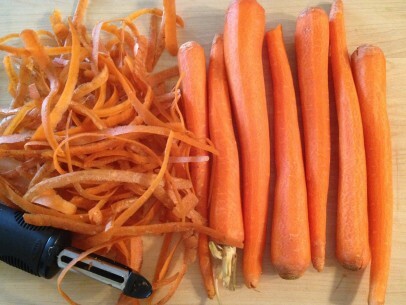 Add mashed carrots and combine all ingredients well. Process or blend in blender or food processor for less than a minute until mixture comes together. Return processed mixture to bowl, cover and refrigerate for at least 1-2 hours or as long as 3-5 days before frying. 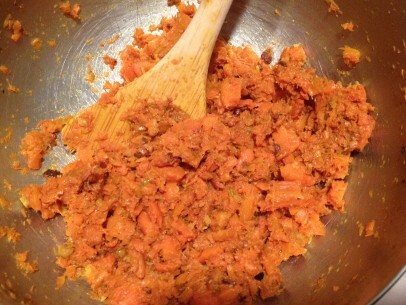 Roll carrot mixture into small golf ball sized pieces- I get 2 keftedes out of a 1/3 cup scoop of batter. In a least 2 inches of hot olive oil, fry keftedes just lightly. I add maybe 3-4 keftedes to the oil at a time and quickly move them constantly turning and rolling them through the hot oil for a total of little over a minute. Once they’ve gotten a crispy outer shell, remove from oil, drain and serve hot. You can quickly cook up the entire recipe in 5-7 minutes. This recipe makes 18-20 carrot keftedes and can easily be double or triple with great results. 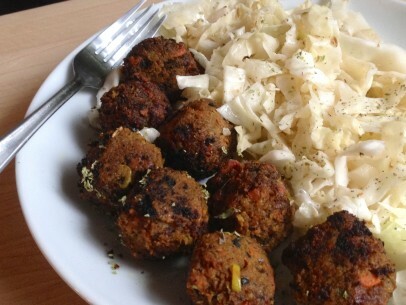 Serve with a side of lahanosalata/cabbage salad, a wedge of lemon, a sprinkle of oregano and a piece of crusty bread. Carrot keftedes are also delicious drizzled with tahini lemon sauce and served with fried potatoes. You’ll find a hundred ways to enjoy them! If I wanted to bake these instead of frying them, what temperature and for approximately how long? Do you think this would work with sweet potatoes, yams or parsnips? I really want to try it but loathe cooked carrots! Hmmmm…… Stella, my concern with the substitution of sweet potatoes is that they contain a lot more water than carrots and that might lead to very soggy keftedes. Hi, do you think this recipe would work well with gluten free bread? I just wanted to let anyone whom may want to know that I baked these at 400f for about 40-45 minutes, and they held together perfectly. Because I can’t for the life of me follow a recipe exactly, I used course ground oats (rolled oats in the food processor) instead of bread crumbs and made the balls 1/8 of a cup big (two tbs). I’m not sure if that’s why they held together so well or what.